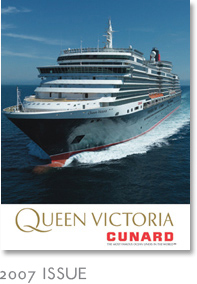 The 90,000-ton QUEEN VICTORIA: distinctive elegance and luxury throughout. From the outside, her classic black and red livery hints at what differentiates a Cunard liner from other cruise ships. QUEEN VICTORIA was officially named by HRH the Duchess of Cornwall at a lavish ceremony in Southampton in December 2007. We were proud to have been commissioned by Cunard Line to mark this inauguration by publishing the official commemorative, hard-cover book.